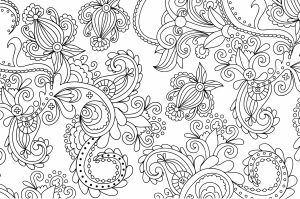 Coloring Craze Party at the Bristol Historical Society continues on January 18th from 7-9 pm. Bring your coloring books and supplies and we supply the wine and cheese. The Society is located at 98 Summer Street Bristol, $5 entrance fee, pre-registration is required, but walk-ins are welcome. For mail requests write to Color Craze BHS PO Box 1393, Bristol, 06011-1393 or call at 860-583-6309. Coloring Craze Party at the Bristol Historical Society continues on Friday, March 15 from 7-9 pm. Bring your coloring books and supplies and we supply the wine and cheese. The Society is located at 98 Summer Street Bristol, $5 entrance fee, pre-registration is required, but walk-ins are welcome. For mail requests write to Color Craze BHS PO Box 1393, Bristol, 06011-1393 or call at 860-583-6309. 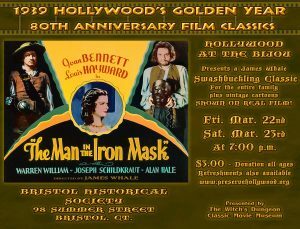 Our new "Hollywood At The Bijou" movie series "1939 the Golden Year of Hollywood - 80th Anniversary". 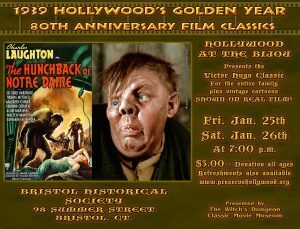 It is a year-long series of 11 classic films - all shown on real film, presented by "The Witch's Dungeon Classic Movie Museum" with vintage era cartoons, each month at The Bristol Historical Society, 98 Summer Street in Bristol, CT. 860-583-8306. 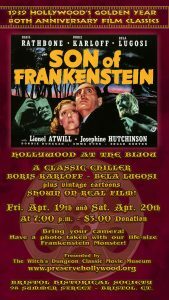 $3.00 donation each showing - popcorn & soda available. 7pm showing on REAL film! 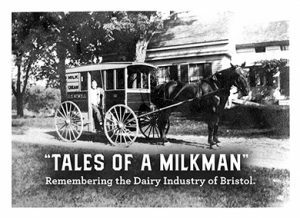 Coloring Craze Party at the Bristol Historical Society continues on Friday, April 12 from 7-9 pm. Bring your coloring books and supplies and we supply the wine and cheese. The Society is located at 98 Summer Street Bristol, $5 entrance fee, pre-registration is required, but walk-ins are welcome. For mail requests write to Color Craze BHS PO Box 1393, Bristol, 06011-1393 or call at 860-583-6309.